The return to theatre of Martin “In Bruges” McDonagh, bringing with him the brand of pitch black comedy that has characterised his film work, could hardly be less than one of the events of the year, but it exceeds even those expectations. Notwithstanding all the modern touches in language and style, McDonagh’s spiritual home is with the Ealing comedies of the 40s and 50s, reminders of which crop up repeatedly in the delicious darkness and mouthwatering morbidity of the humour in this hilarious play, an audacious cocktail of fact and fiction. 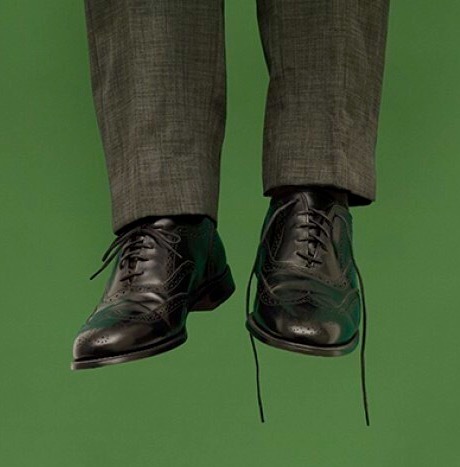 The opening scene sees a grizzly 1963 execution, presided over by hangman Harry Wade (David Morrissey, wearing a smart suit and trademark bow tie) and his bumbling assistant Syd Armfield (Reece Shearsmith). The deed done, a remarkable set transformation takes us on to the pub run by Harry in Oldham, two years later. With capital punishment about to be abolished, the pub’s all-male regulars, each of them a self-confessed alcoholic, continue to follow the “flog ’em and hang ’em” line, cowering in fear of of Harry’s intimidation, as if expecting that he could be about to produce his rope. And then a mysterious, “menacing” Southerner (Johnny Flynn) enters the bar. A detailed description of the mayhem that follows could spoil the fun, but let it just be said that Matthew Dunster’s production takes its time to develop characters during the first act and then lets rip in the second. Morrissey plays Harry completely straight, as a vain and arrogant bully, piqued that his rival Albert Pierrepoint (the real-life executioner) gets all the limelight because his stats have been boosted by the executions of German war criminals, thereby dwarfing Harry’s meagre 233. Shearsmith’s Syd is stuttering and pervy, he and Harry making a grim equivalent to Laurel and Hardy (the other way round). The comedy highlight comes when an indignant Pierrepoint (John Hodgkinson, looking like a mirror image of Morrissey’s Harry) bursts into the bar to start a sort of nooses at dawn duel and, unwittingly, triggers the final execution of his career. Everything is in the worst possible taste, with McDonagh’s razor-sharp dialogue and astute character insights propelling the action. Underlying all the humour is the irony of working class executioners slaying mostly their own kind at the behest of imperious judges. Anna Fleischle’s immaculately detailed sets and Joshua Carr’s lighting add to the pleasure and the supporting performances are first rate. At the end, Harry and Syd, looking like Ollie and Stan, rue the passing of an era. They have done their very best to ensure that the great British tradition of miscarrying justice lives on. Pure genius.